Are you a business traveller? 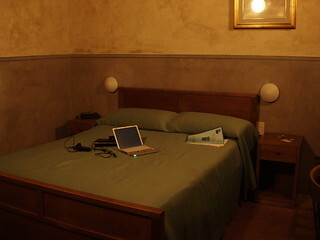 Do you need to spend at least some of your nights away from home, somewhere in a hotel? Do you have a company laptop? If you answer is yes, then you're like me. I also have a company laptop with MS Windows already installed on it. To be honest, it is not a top-range laptop, although I cannot call it a low-range one either. Something average, or just below average. But how much time do I spend turning this laptop on each time? I don't know about you, but my laptop takes about 5-10 minutes to boot. That is not only because of MS Windows XP, which was installed God knows when and then never properly "cleaned up" of the inevitable mess. That is more to do with all the corporate applications that start with Windows. All those antivirus, screenshot tools, internal communicators, remote access tools and so on. Do I need most of them, when I arrive at the hotel late in the evening, and only need to check my e-mails, maybe chat with family and friends and read some news? Of course not! Then, why do I need to load all that crapware software? I do not want it! My solution, which I have been using for quite some time now, is simple: a separate USB stick. Yes, that is a USB stick with Live Linux on it. In my case, this is Xubuntu 12.10, put on an 8 GB USB stick with the Unetbootin tool and with the persistence option. What do I have as a result? The boot time is 1 minute 45 seconds. And I get the fully operational system, with browser, simple editing tools, image viewer and so on. Because of persistence, all that stuff is pre-configured to my taste. And the "keep it simple, Stupid" principle rules that USB stick. That USB runs almost stock Xubuntu 12.10, with only a few design changes, like moving the taskbar to the bottom of the screen. Stock software changes are also minimal. For example, that Live USB has Firefox as a browser, even though in all other occasions I prefer Chrome(-ium). But that's not the "stock" Firefox. That is a slightly tweaked Firefox which looks more like "Chromofox". What this Live USB stick does not have is all the eye-candy blips and blobs: Compiz, LibreOffice, etc. Why do I need them in field conditions? That's enough for me. I am in the hotel, plugging in the USB stick, booting from it, and under two minutes, I am up and running in my familiar environment. You don't know which operating system to start with? Read reviews on this blog. If you want to try it yourself, why not order a CD with the OS of your choice via buylinuxcds.co.uk? Here's a simple, fast solution: put it to sleep instead of shutting it down each and every time! It can stay asleep for days on a charge, it will be ready when you need it in an instant and will remain in the exact state you leave it when you put it to sleep. It's also extremely easy, you just close the lid! To some point, it depends on the battery, which is also a downfall. I hate the put it to sleep option. Trying to get the thing to wake up is like trying to wake my 11 year old son for school in the morning. You hit the button and it does nothing, hit it again to find out you've now actually started the shutdown sequence and not only now do you have to wait 2 minutes for a shutdown, you now have to wait 5 minutes for windows updates (if you are lucky) and 5 to 10 minutes for boot up. Give me the linux boot up from cold option everytime. My Linux of choice to carry everywhere is actually Puppy Linux but I think Zorin Lite or Xubuntu would be good. Gary, we're obviously in the same "sleepy" boat! ;) Cold boot should be fast, whatever the other options are. And Linux is safer, especially in not-very-trustable hotel/café environments.